Perusing a guide to taking underwater pictures with a digital camera reveals that it's possible to snap eye-catching shots of sea life without taking countless lessons or draining your bank account. The advent of digital technology has made underwater photography more popular than ever. These days, everyone from marine biologists to amateur divers is opting to document their underwater adventures with digital photo equipment. Today's trend is a far cry from when the first underwater color photo was taken in 1926. Back then, Dr. William Longley and National Geographic staff photographer Charles Martin were forced to use a large film camera encased in waterproof housing and multiple pounds of highly explosive magnesium flash powder to illuminate their underwater environment. Underwater photo equipment has since evolved to include lightweight waterproof cases and water-resistant point-and-shoot cameras. 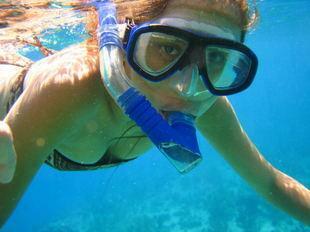 The most popular equipment used in taking photos underwater includes specialty waterproof cameras and waterproof cases. You can snap sea life with a digital camera. Waterproof Olympus Stylus 790 SW: Olympus is known for its excellent digital cameras and this model is no exception. The Stylus 790 SW is waterproof and shockproof, which makes it ideal for taking pictures at the beach or pool. SeaLife SL 320 Reef Master Mini Digital Camera: With this compact waterproof 6.1-megapixel digital camera, you can take photographs as you explore above and below the water. 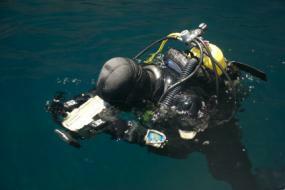 The camera features a large 2.5-inch LCD screen, which allows for easier viewing of images underwater. The SL 320 also includes an instant focus feature and its rubber armored, shockproof body is depth rated to 130 feet. Pentax Optio W30 Waterproof Camera: The Optio W30 allows you to record amazing underwater still images and movie clips, up to a maximum of two hours and to a depth of three meters, without requiring a waterproof housing. The affordable compact digital camera combines a 3.2-megapixel imager with a Pentax 3x optical zoom lens. You can take it to beaches, rivers, lakes and pools without worrying about dirt, dust, sand, water or moisture. Experiment with composition: Angle your body in a way that will provide you with the best position to take your shot. Also, remember to control your breathing and buoyancy before pressing down on the shutter button to avoid taking blurry images. Be patient: Approach your photo subject with care. Sudden movements will scare away sea life. By employing patience you will be able to capture awe-inspiring shots of life under the sea. Shoot and shoot some more: You should aim to take multiple photos of the same subject, if possible with various settings. Doing so will help you avoid the disappointment of missing spectacular shots of fickle fish. Lighting reminders: As you swim deeper under water, light diffuses. This means that your underwater digital camera will produce images darker than those images taken on land. To avoid this, make sure you modify your camera's white balance to get shots with realistic colors. Size matters: Pictures taken underwater appear larger than those taken on land. It's important to check your underwater digital camera's viewfinder to ensure you are recording the angle and size that you want. No guide to taking underwater pictures with a digital camera would be complete without including a note on preparation. It's vital that you submerge an encased camera in water before proceeding with your shoot. By dipping your camera into the water first, you can check to see if its waterproof casing has leaks. In addition, make sure there are no pieces of sand or hair caught in between the seals. These minute spaces can allow water in, which can damage your camera.